After traveling from Milan to Chiavari, and Torino to Chiavari, my friend Mindy and I headed out for two nights in my Soul City, Florence. We boarded the train after a 20-minute delay, traveled along the coastline of Liguria and to Pisa where we ran to catch train number two. The closer we traveled to Florence, the darker the sky became. 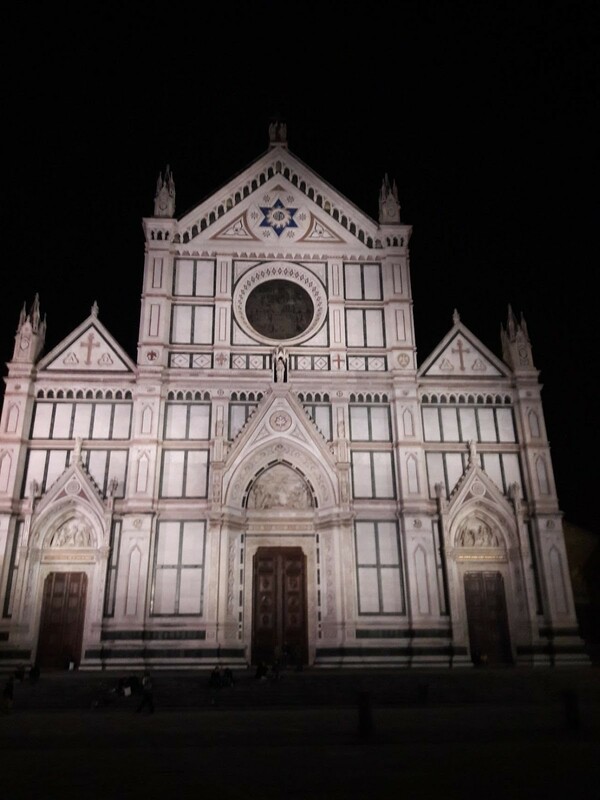 Yet, even when the day is filled with clouds, the exquisite beauty of Florence shines through the darkness. My slowly healing foot was very uncomfortable after all the walking in Torino the previous day. It was time to pay the Piper, or the Taxi Driver, to carry us to our hotel at the edge of Centro Storico. Hotel B&B is a bit off the tourist track. Locals live in this neighborhood and we discovered an excellent place for our dinner. You see, it was Thanksgiving Day. We chose to bypass a traditional American Turkey Dinner for another famous meat meal. We expressed our thankfulness by enjoying Bistecca alla Fiorentina, the famous blood rare Beef Steak of Florence, at Trattoria Coco Filippo, a quirky basement restaurant frequented by locals. It was a 3-minute walk from the hotel. Our antipasto was toasted bread with stracchino cheese and black truffles. We drank Vino Chianti with our very rare steak and contorno of Chicory and slices of potatoes cooked in olive oil (all so delicious). We finished our meal with Vin Santo e Cantucci Biscotti. We waddled back to our hotel and called it night. Friday was going to be a busy day. In the morning, we called another taxi to carry us to the Accademia, the Museum whose claim to fame is the magnificent sculpture of David by Michelangelo. No matter how often I see it, I am amazed. How did the artist accomplish this sculpture? I adore the way you can see the blood vessels in his hands, the muscles tensing, the rib cage and more. We grabbed a panino each for a quick lunch by the river before entering the Gallery. The quality and abundance of the art within the Uffizi is inspirational and can be overwhelming. Sculpture from Roman times, art from the Middle Ages precede the art of the Renaissance that I personally find so remarkable. Here are a few of my favorites. The detail and perspective are nearly perfect. Leonardo Da Vinci, a man of many talents. Not only is he the king of perspective and light, his detail is perfection, his background is mystical and every curl of hair, every feather on the wings of the angel, each expression is exquisite. I could post photos of artwork by Ghirlandaio, Signorelli, Vasari and more. This place is a MUST SEE for lovers of Italian and Roman art. Next, Mindy and I walked across the Ponte Vecchio, the Old Bridge, to explore the Oltrarno, the other side of the Arno River. There is a story that states that even Hitler could not destroy this bridge during World War II, even though the Germans demolished all the rest. Now, this bridge is the gold capitol of Florence while the other side of the river houses many artisan shops to explore. After spending too much money on an unusual pair of shoes, we walked back across the bridge toward the center of Florence, and the Duomo. We explored the exterior of the Baptistry and the Duomo while an excellent cellist serenaded all the travelers. I drank another coffee and waited as Mindy reserved time the next morning for a climb to the top of the Duomo e Campanile, the highest spots in the city and inside the dome of the Church. There was no way my foot would allow me to accompany her. In fact, after our time here and shopping along the walk to the hotel, we needed another taxi ride to the hotel because of my not quite healed, aching foot. But the night was young. After resting a bit in our hotel, we ventured out to meet a friend of mine, Ms. Patti DeRosa, by Santa Croce. Patti is a well-established musician and vocalist in Florence. We have been Facebook friends, musical amiche, friends, for quite a while. After greetings with cheek kisses, Patti guided our walk to The Gallery Bar on Via dei Benci. For 10 Euros each, we had our choice of an adult beverage and all we could eat of Aperitivi on steroids. Here in Florence, this incredible food extravaganza is called apericena, or dinner of aperitivi. It is an all you can eat buffet and an inexpensive way to share a meal with friends. We talked and laughed until our sides ached and our eyes were sparkling. With full hearts and stomachs, we left The Gallery and headed for our prospective homes. We discovered that our hotel was nearly in Patti’s back yard. She knew the area intimately and even treated us to wonderful gelato before parting. After a restless night, Mindy got up early to climb to the top of Florence. I slept in and met her at noon by the Duomo. We shared a beverage and said our goodbyes to Firenze, Florence, for this time. We reached my home after dark and called it a night. My friend Mindy left the next day to spend her last night in Italy in Milano. My foot was done. My taxi fares were all paid. And I was beat. Still, it was a fabulous week of laughter and adventure with my friend from Minnesota. We had our fill of art, traditional foods and wine and great camaraderie. There are so many places to experience in Italy. Mindy has only had a small taste of it all. Maybe next Spring she will return and explore Rome and the surrounding area. I hope so. Where you do want to explore in Italy? What kind of adventure do you seek? When you are ready, I can help. Until then, ci vediamo dopo, see you later.